Well, friends, it's my 24th birthday! It's hard to believe I am almost to my quarter life milestone because I still feel like I am too young to really be an adult. My hubby made me a delicious breakfast and we have a quiet day planned but he is taking me out to a fancy dinner later... I am a lucky wife to be married to this guy. In other news, I start my 4th semester of law school on Monday. It's hard to believe I am halfway through law school. It's actually pretty surreal. I have a busy tough semester ahead of me: 5 classes (3 super challenging ones) plus working and my Moot Court competition will take place this spring. I am vowing to get off on the right foot in 2018 and I want to rock this semester. I know... those who have been following for a while are probably thinking I say this before every semester... and you're right. 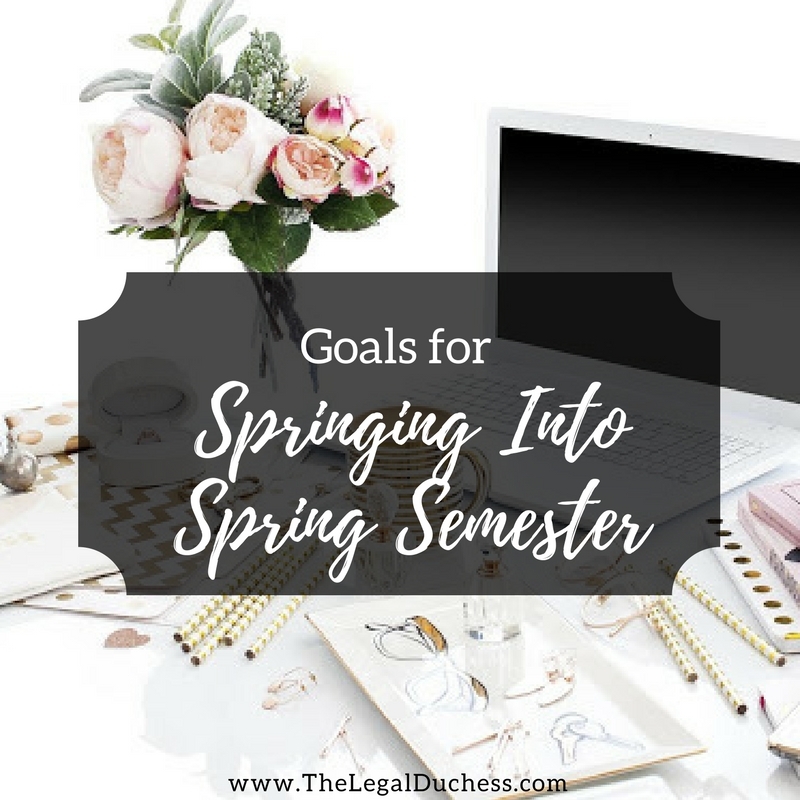 I do try to motivate myself at the beginning to do my best... throughout the semester I do tend to run out of steam because well, law school is really hard. Following Fall semester, I am mostly pleased and yet still a little disappointed in myself. A few of my grades were great and I was super proud of myself. A few others.... not quite so proud of myself. it's all relative I suppose and balances out in the end. I still hope to further improve my GPA this upcoming semester and get one step closer to finishing my law degree. In order to do this, I have set some goals to work towards as I spring into spring semester (yes I know, terrible puns but I can't help it). It pains me to write this but it's the truth... I always seem to think I am going to start getting ready for finals nice and early and I still always start later than I would like which leaves me working like a mad person for the week before and weeks of finals. With only three in-class exams this semester, I really think I can manage to start reviewing for those exams much earlier. Fingers crossed that my willpower stays strong. I hope to have my outlines done plenty early and be able to start practice problems, practice essays, flashcards and study group a full month out from final exams. I think this will set me up for better exam success in two of my toughest classes this semester: Evidence and Secured Transactions. I do not have class on Monday until 5:55pm. I am going to utilize my mostly open Monday's to *hopefully* crunch out all of my reading for the week so I can spend my time revising class notes, working on Moot Court and outlining after classes. I tend to run out of steam for reading and taking good reading notes as the week goes on so if I do it all by Monday night, I will be fresh and ready to read well and take excellent reading notes. I will then do a 15-minute refresher before class to make sure the reading is fresh in my mind before class. I hope this will make my weeks more productive and leave me with more time to work on goal one, reviewing earlier. The longer I am a law student, the more I am recognizing my faults and the more I am trying to overcome them to consistently improve my grades and performance. Both these goals are a result of that. 3. Make Law School more "9-5"
I have always had a weird schedule in law school. I tend to sleep in, go to class, take a few hours to relax and then pick up my work and study late into the night. I know it sounds insane but it is the schedule that worked for me because I am a total night owl. This semester, I have early morning classes three days a week and night classes until 8pm four nights a week... this forces me to change up my normal schedule quite a bit. 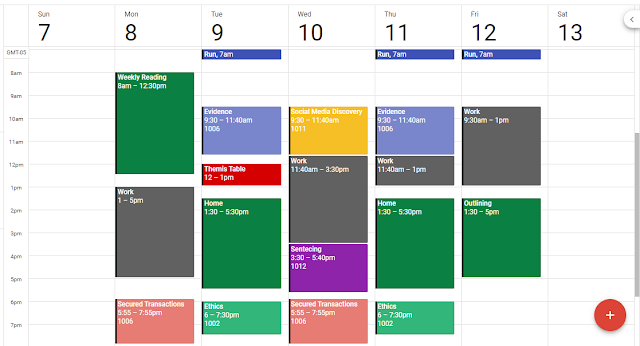 I hope to stay productive and adjust my schedule into more of a "9-5" law school schedule. In between classes and work, I will work on my school work, moot court problem and reading. Then when I come home from night classes, I can relax with my husband a little bit and do some Yoga before going to bed at a normal time. My goals of completing my weekly reading by Monday night will also help with this I think. I hope this new schedule will work out and make my weeks productive while still getting enough sleep. I did so much better with outlining last semester! I was very proud of myself for having them done well before exams. I plan to keep that up this semester by outlining my classes weekly each Friday when I have no class. I work Friday mornings and I can come home and outline all afternoon while I throw in a few loads of laundry. This leaves my weekends a little more open for having a life, lol. There we go! My spring semester goals. I hope everyone has had an enjoyable break and is ready for another great semester. Best of luck to all of you! I started getting all my weekly readings done over the reading the beginning of my 2L year and it has been the best study practice (especially now into my 3L year). It just gives you so much more time during the semester. Good luck!